Gasboy Atlas Fleet Fuel System | CSESCO INC. Whether underground or aboveground tank installations, or fueling rates from 15 to 50 GPM (57 to 188 LPM), there is a Gasboy fleet fueling system or commercial solution for your application. All models are designed specifically for the demanding requirements of fleet and commercial fueling needs. Suction pump models are built with heavy duty, belt-driven pumping units, and all models contain the industry' s most accurate positive displacement meter. Electronic and mechanical registration models are available. For saddle tank fueling applications, satellite dispensers are offered for fueling on both sides of the vehicle. 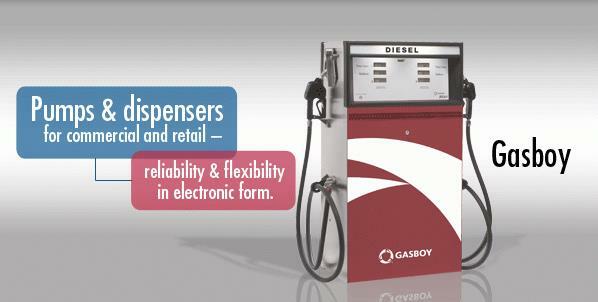 Gasboy dispensers are compatible with methanol and ethanol for alternative fuel applications. Most models have Underwriter's Laboratories (UL) listings to meet safety code approvals. Visit gasboy.com to discover what Gasboy solutions best fit your needs.